I am very excited to show you the second garment I have made using fabric printed with one of my Mum's own paintings. You may have seen the dress I made a few weeks ago with a Eucalyptus design. 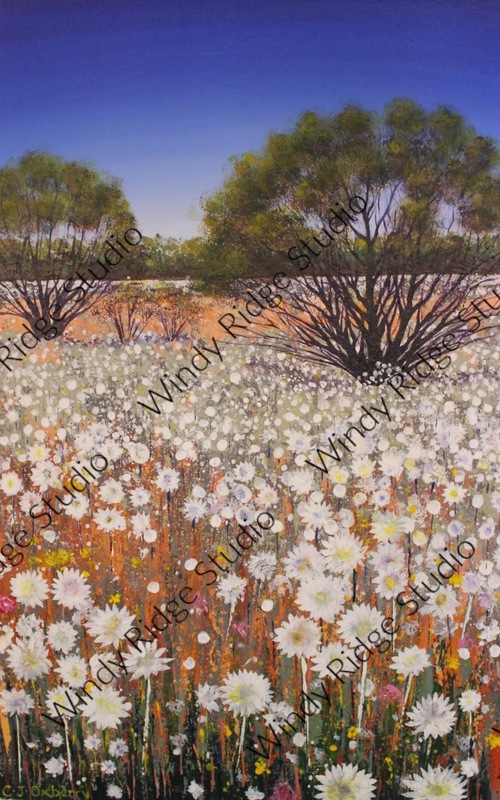 This painting depicts masses of everlastings (flowers) on a red-earthed, Australian outback landscape. I chose the lower part of the painting for the design with just a bit of the tree at the top. I had the fabric printed by Contrado UK. This is the 'Slinky lycra matt 210gsm' and I absolutely recommend it for a swimsuit. The fabric is beautiful quality, soft but firm with good stretch recovery. The printing turned out really well on this fabric too as the colours are accurate and very vibrant. I have spoken about ordering from Contrado in this blog post. I ordered a piece of fabric 100cm wide by 60cm long and just squeezed this swimsuit out (size 8 body, size 5 cup) with only tiny scraps left over - perfect! I had worked out my exact fabric requirements before ordering so I didn't have any waste. I cut the pieces from a single layer of fabric, which meant more cutting, but much less wastage, so totally worth it when working with special fabric. The pattern is the Sophie Swimsuit by Closet Case Patterns. I have made this before and loved it, so the choice was easy. This time I added an inch to the torso length as my last one was just a bit short in the body causing a rather unfortunate chesty wardrobe malfunction on a very crowded beach! I think now this one might be a tad too long as there is some wrinkling at the back, but it's definitely to be better safe than sorry. The swimsuit is lined with orange lycra from my ridiculously extensive lycra stash. Other than that, everything was the same as for my previous Sophie Swimsuit. This project took a lot of plotting and planning with my Mum, detailed measuring of fabric requirements, designing and ordering from the Contrado website, super careful cutting and slow sewing. I am so impressed with this whole concept Megan. So lovely to be able to incorporate your mother's art work into your sewing and with such fabulous results. I am in awe. Thank you for the lovely comment. It was very special to collaborate with my talented mum! They - and you - look amazing. I do so love the mother/daughter collaboration. 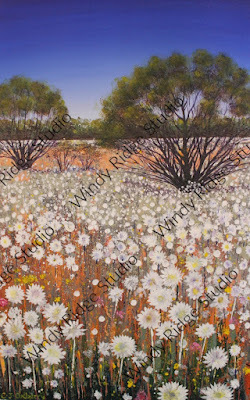 My mother was an artist too, but I don't think her paintings would suit fabric, so I'm rather jealous. This swimsuit is totally epic and you look lovely in it. This is absolutely amazing! I rarely comment on the many blogs I read, but your project is so spectacular! I'm looking forward to see more collaborations from you and your mom! Everything about this is awesome! So fun to make such a special one-off garment. And unlike ball dresses, swimsuits don't last very long so you can have the fun of repeating this process all over again! It must be great to have a swimsuit pattern that you love. I missed the post on your eucalyptus dress, so I am off to read it now. You and your Mum are incredible. The painting is stunning and to turn it into a printed fabric and then the most gorgeous swimsuit, delights me no end. Well done Meg and well done to your Mum. I love this! What a beautiful suit. I love that you are working with your mom's artwork. This was a great painting for this suit. Beautiful! This is beyond amazing though!!! Love love love! 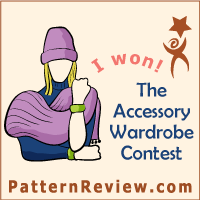 Another Sophie swimsuit win too!